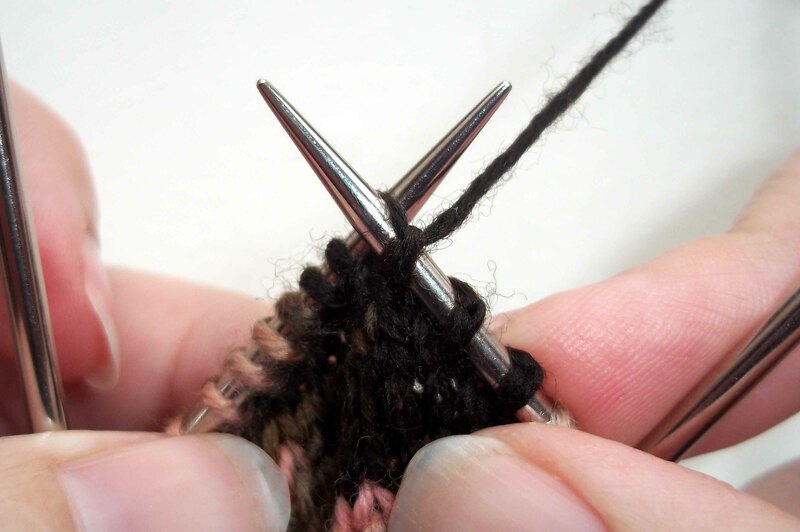 After research and careful consideration I’ve decreed the Double Stitch Short Row Heel above all others, however many knitters don’t know how to work it. So, here’s a photo tutorial on this fabulous heel so you too can become a convert. 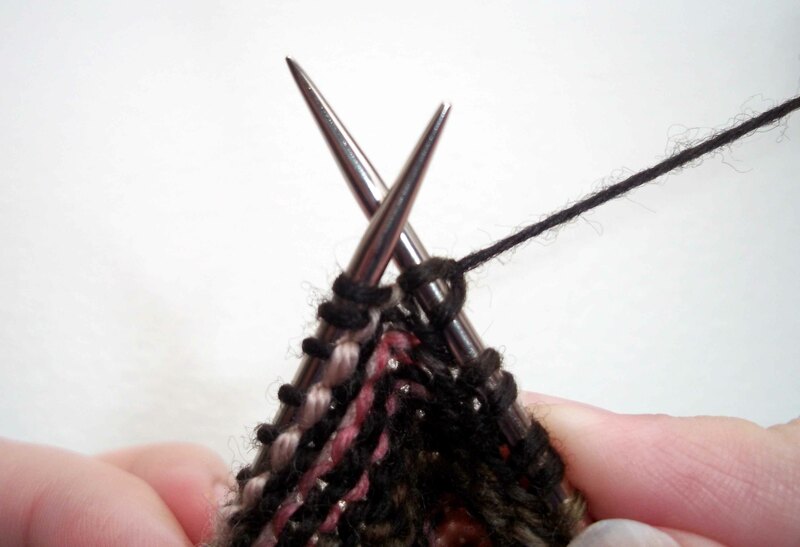 Knit to the stitch you want to be a double stitch; to begin the heel you would knit to the last heel stitch, then knit that stitch. I have three double stitches completed in this photo so you can see what a completed double stitch looks like. 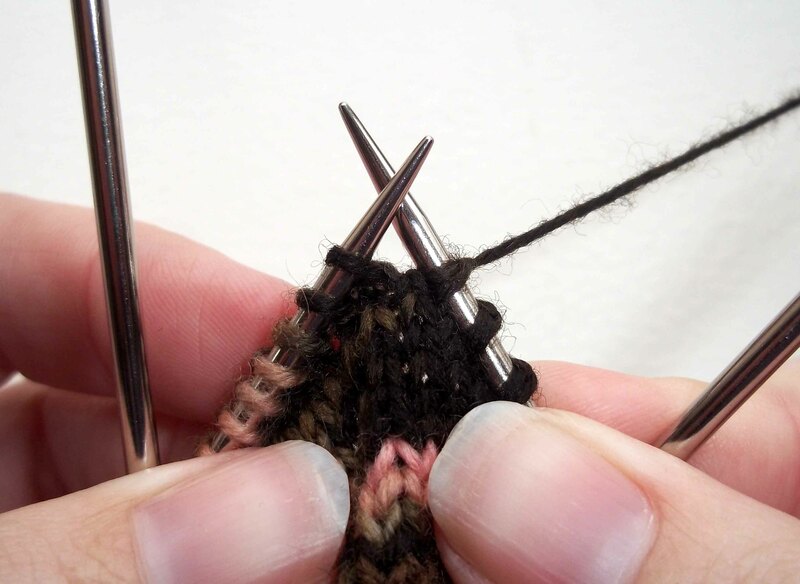 Knit the last stitch before your double stitches. This is your next double stitch. Turn your work and slip the stitch you just worked onto the right needle purlwise, keeping the yarn in front of the needle. Pull the yarn to the back hard, bringing the legs of the stitch over the needle. Bring the yarn between the needles and purl across to the other side. 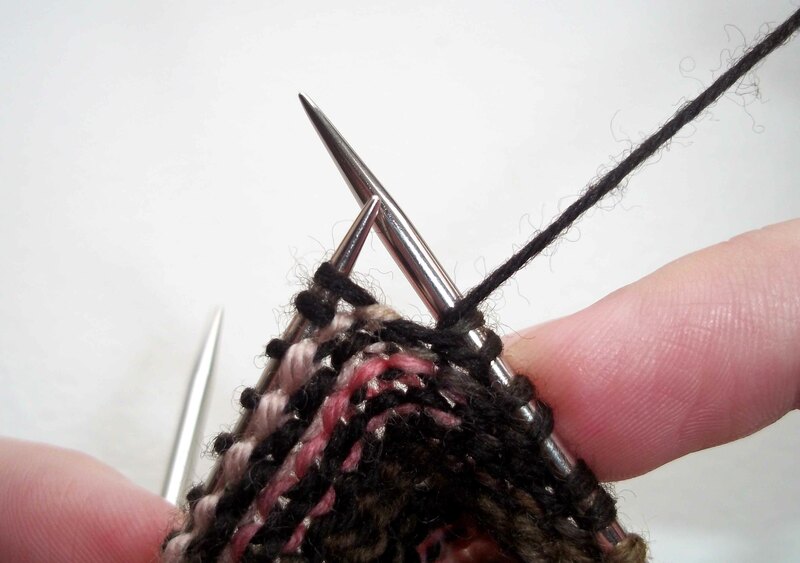 Once you've purled across to double stitches on the other side, purl your last stitch. This will be your next double stitch. Pull the yarn back hard, bringing the legs of the stitch over the needle. As you can see the double stitches aren't as loose on the right side of the work. 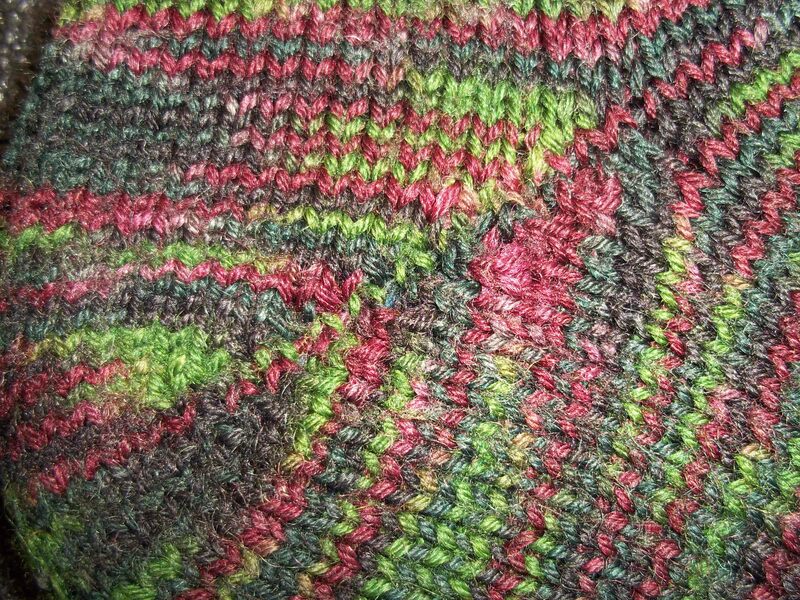 Knit across to the double stitches on the other side of the heel. Knit the two loops of the double stitch together. 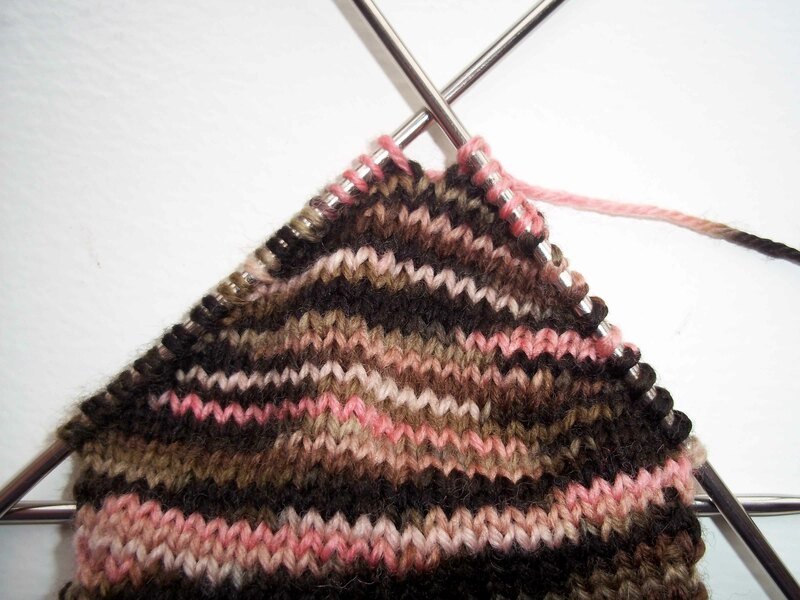 Once you’ve knit your two rounds you need to finish turning the heel by working your double stitches in reverse i.e. working your way back out to the edge of the heel. 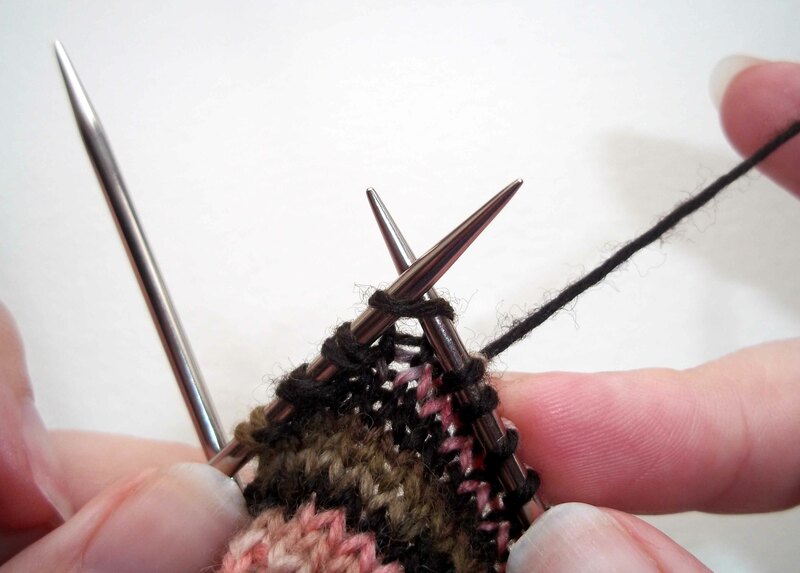 So, instead of your first double stitch being at the end of the heel it will be at the beginning of your heel. Row 1: (RS) Knit the stitches of your center panel, knit a double stitch into the next stitch, the first stitch of your side panel. Given the sample numbers above you would knit 5 stitches and work a double stitch into your 6th stitch. Row 2: (WS) Purl all the stitches of your center panel, work a double stitch into your next stitch. Given the sample numbers above you would purl 10 stitches and work a double stitch into your 11th stitch. Row 3: (RS) Knit across to your double stitch, then knit that stitch. Work a double stitch in the next stitch. 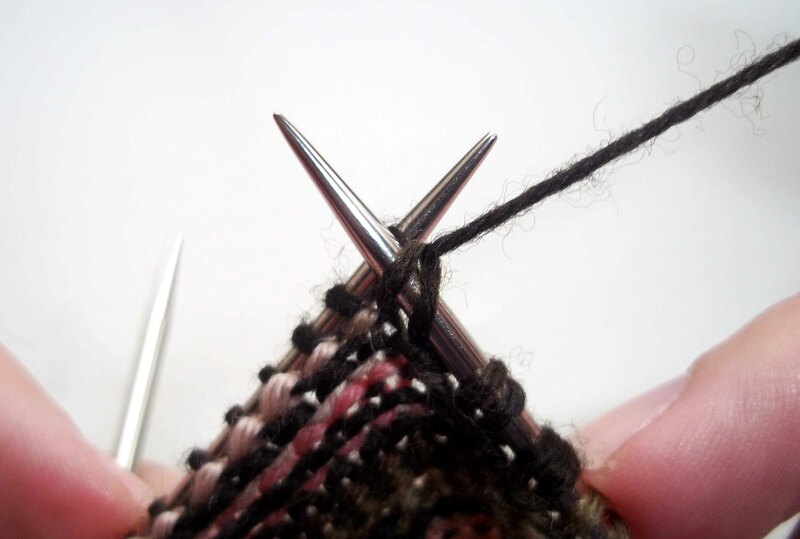 Row 4: (WS) Purl across to your double stitch, then purl that stitch. 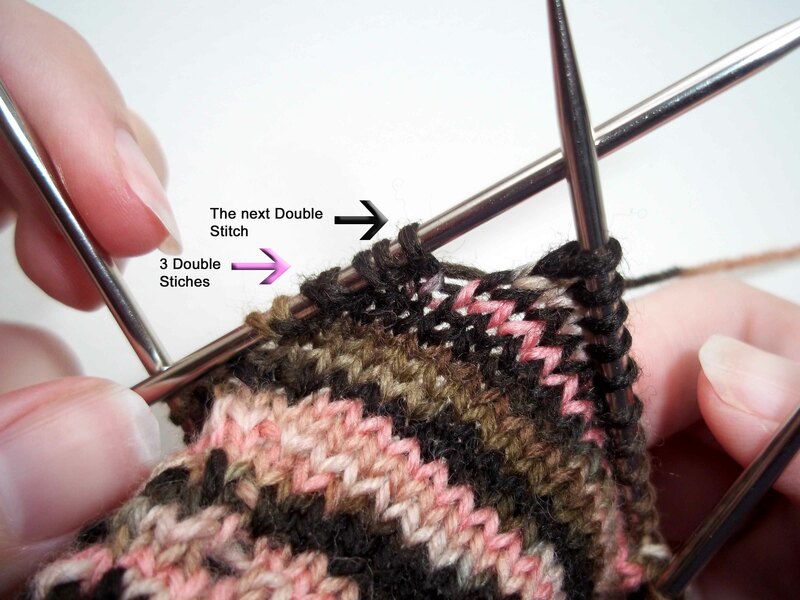 Work a double stitch into the next stitch. Keep repeating Rows 3 & 4 until you’ve worked double stitches into all your side panel stitches. Then start working in the round again. 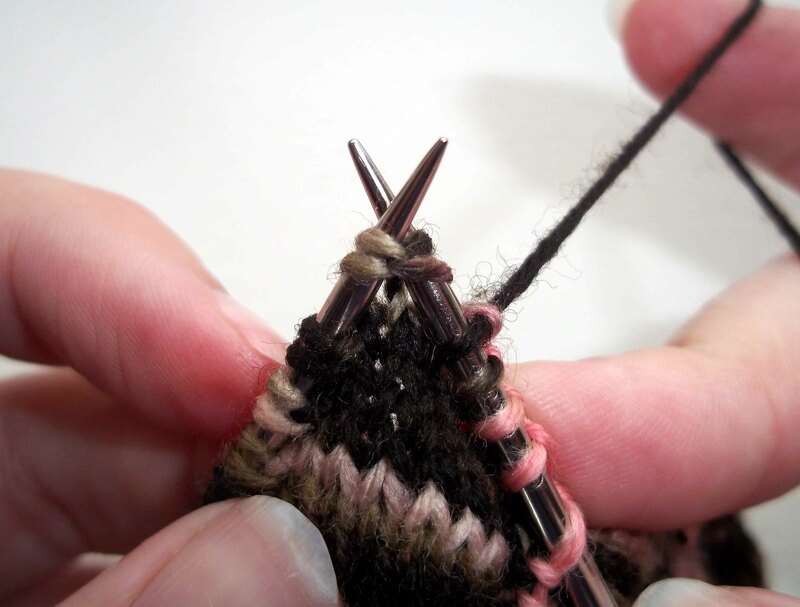 Pick up the loose strand on either side of the heel when you reach it, give it a twist, and knit it together with the first upper foot stitch to avoid a hole. Completed double stitch short row heel. 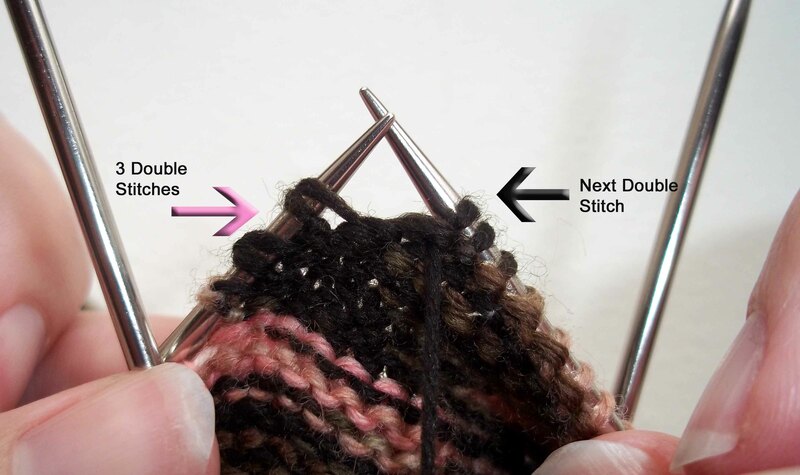 Double stitch – to make a double stitch (dbl st) knit the last stitch before you turn your work. Turn your work. Then holding the yarn in front of the ndl, sl the st you just worked pwise onto the RH ndl. Bring the yarn over the ndl to the back hard, pulling the two legs of the st below the slipped st over the ndl, making a dbl st. Continue knitting. If a purl row, bring the yarn between the ndls to the front. Row 1 (RS): K all sts on Ndl 1. Turn your work. Row 2 (WS): Work dbl st. Bring yarn forward between ndls, P to end of Ndl 3. Turn your work. Row 3 (RS): Work dbl st. K to last st BEFORE dbl st on Ndl 1. Turn your work. Row 4 (WS): Work dbl st. P to last st BEFORE dbl st on Ndl 3. Turn your work. Repeat Rows 3 & 4 until there are 10 (10, eight) dbl sts on either side (your side panels) and 10 (10, eight) ‘regular’ sts in the middle (your heel). Work 2 rnds circularly, knitting dbl st loops together as a single st, and cont. foot pattern stitch on Ndl 2. Row 1 (RS): K 6 (6, 5) sts. Turn your work. Row 2 (WS): Work dbl st into the first st of side panel. Bring yarn forward between, ndls P 11 (11, 9) sts. Row 3 (RS): Work dbl st. K across to dbl st on Ndl 1, K dbl st, K1. Turn your work. Row 4 (WS): Work dbl st. P across to dbl st on Ndl 3, P dbl st, P1. Turn your work. Repeat Rows 3 & 4 until all your side sts are added back in as regular sts.